Everything you need to know about the terpenes found in cannabis! Terpenes are the natural, oily and aromatic compounds produced by the cannabis plant, and many other types of plant. The terpene compounds are responsible for the rich aromatic smells produced by cannabis. Many people feel terpenes are a powerful modulator, or influencer, of the cannabis high. Terpenes themselves have physical effects on the body, and they are produced from the same plant glands that produce cannabinoids. If you have ever grown Orange Bud and rubbed your fingers in the buds you will notice a zesty citrus smell which can still be there when many of the other scents have evaporated away. That’s because Orange Bud contains high levels of the terpene limonene. There are over 100 terpenes, each with their own scent, flavor and medical effects. 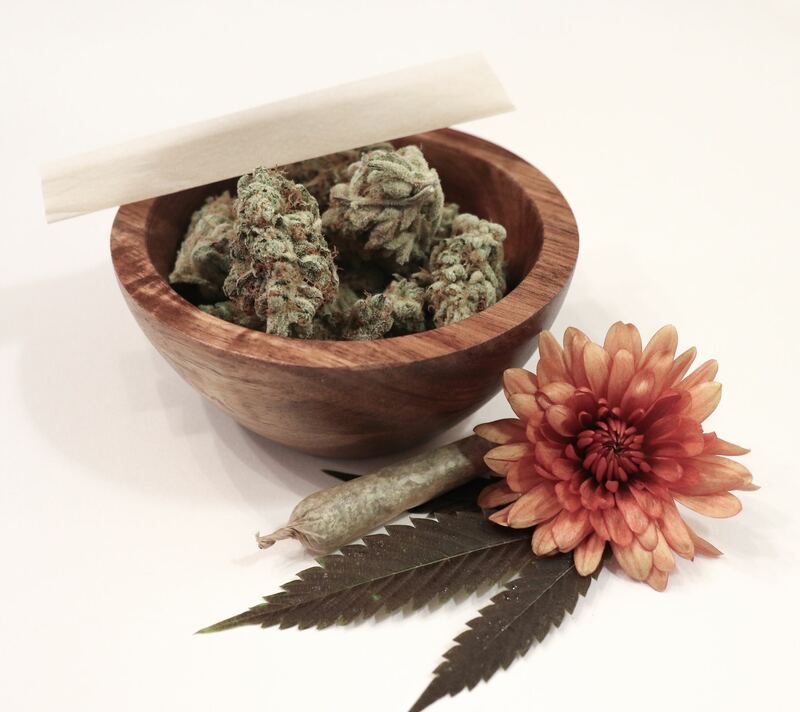 They allow unique aromas for our favorite cannabis varieties. And terpenes occur in other plants too, from tree leaves to flower petals. Fungi, algae, and bacteria also produce terpene compounds. Natural terpenes are responsible for the unique scents which give a sense of calm when breathing in the fresh fragrant morning air from a forest or when walking past some garden flowers. Terpenes are used extensively in the pharmaceutical, biotech, food and cosmetic industries. They are a diverse range of chemical compounds, varying from relatively simple compounds to complicated structures. Terpenes are delicate compounds that can easily be lost from the buds if the grow room is too warm, or if the buds are over-dried and badly cured. Many of the terpenes in cannabis are already well known and understood from their presence in flowers, fruits, spices, and other natural plant and animal sources. 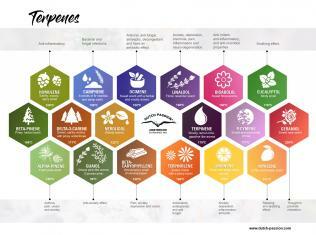 Aromatherapists have known about, and used the different terpenes and their aromas for many years. Ocimene has a sweet scent,with a herbal and woody aroma. It is found in mint, parsley, pepper, basil, mangoes, orchids, and kumquats. It is thought to offer value as an antiviral, antifungal, antiseptic, decongestant and have an antibiotic effect. It vaporizes at just 100­ºC. This is a delicate terpene and one which requires careful bud drying/curing to preserve. With a strong smell of a woody pine smell, beta pinene is one of the most common terpenes in nature. Found in pine trees, cumin, hops as well as cannabis. Vaporizes at 166ºC. There are 4 terpenes (alpha, beta, game and delta versions) of Terpinene. 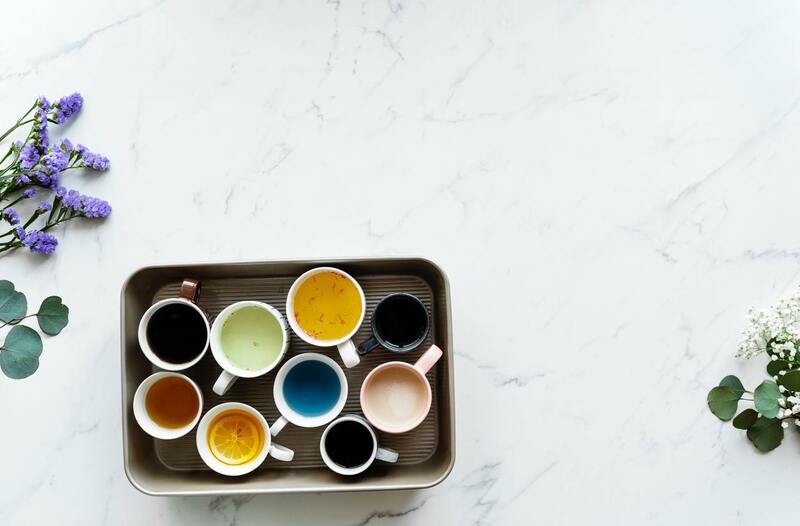 They are all colourless liquids with an aroma of turpentine oil. Vaporizes around 175ºC. Guaiol is a terpene found in Cypress Pine, Guaiacum and cannabis. It melts at 92ºC and is thought to act with an anti-anxiety effect. All the above effects and influences provided by terpenes is fascinating in isolation. 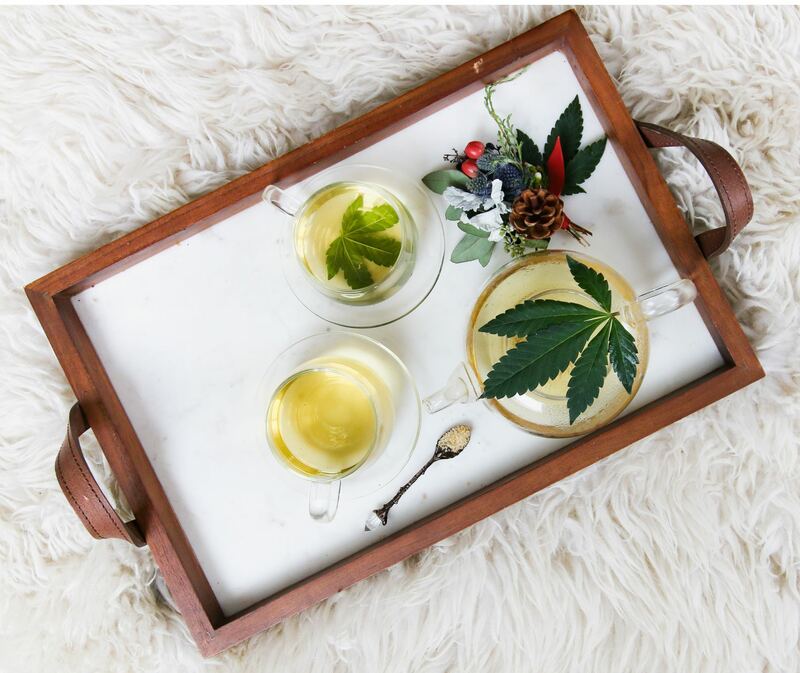 But the whole subject of terpenes becomes much more intriguing when we consider how they may have an entourage and synergistic effect with each other as well as other natural components of cannabis. For example, do certain terpenes amplify the effect of specific cannabinoids? Some cannabis connoisseurs feel strongly that this is the case. Sometimes you find a blissful variety that ticks all the right boxes for your personal endo cannabinoid system. 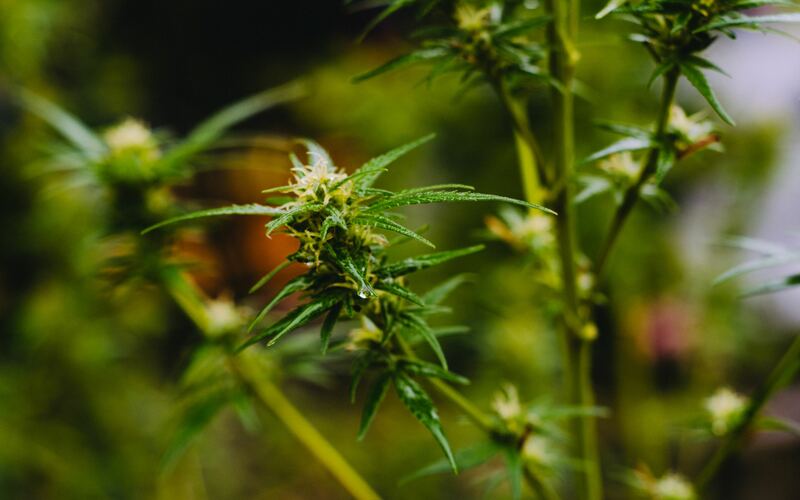 Maybe that is because of the genetics and grow environment combined to produce buds with a sweet-spot of cannabinoids and complementing terpenes. LED grow lights have become a mandatory item for many USA legal growers if you want to produce ‘Grade A’ top shelf buds. Yes, the best LED grow lights are expensive. But they are now fully proven to produce superior cannabinoid levels and higher terpene content. Otherwise people wouldn’t buy LED grow lights. The superior results with LED are due to inherently lower heat stress levels and a superior light spectrum. Sodium lighting was originally developed to meet the need for low cost lighting and street lighting. HPS lights contain mercury, emit a lot of heat and use a lot of energy producing less useful wavelengths for cultivation. HPS has never been an optimized spectrum for cannabis, but it is a usable spectrum and it’s cheap. The best LED grow lights have been developed with light frequencies optimised specifically for cannabis growing and produce better quality results if you don’t mind paying extra for the technology. It’s a one-off investment which will give a permanent quality upgrade to your buds. If you are growing autoflowering seeds or feminized seeds and want to enhance cannabis terpenes then take a close look at LED grow lights. The emergence of spectrum-adjustable LED grow lights has allowed some novel approaches towards growing. The California Lightworks SolarSystem series, and the Growspec Sunray lights both have adjustable spectrum control. If the red light is removed from the spectrum for the last 2-4 days, and just blue light given to the plants, you will notice a significant increase in terpene production. There are different theories about how and why blue light treatment works. But growers have noticed that it definitely does. Red light is important for bloom and bud growth. But if bud growth reaches it’s maximum just before harvest, then in theory you can eliminate red light 3-4 days before harvest and not impact final harvest quantity. 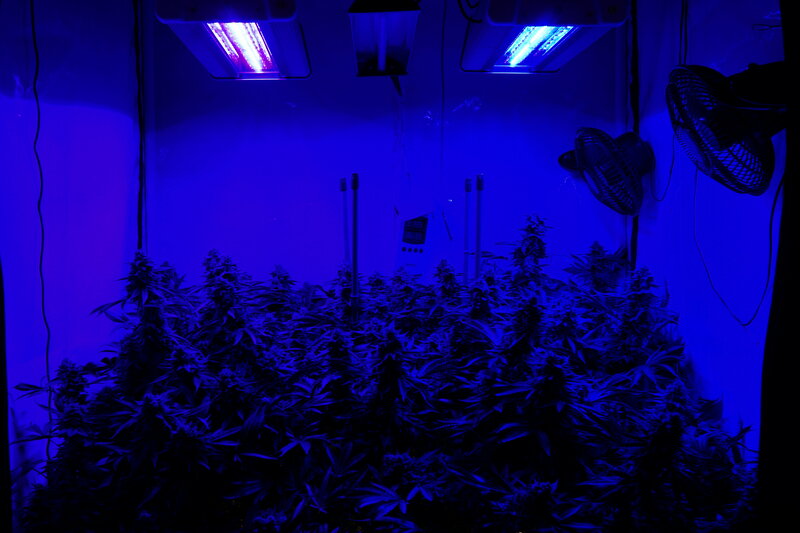 By offering only blue light, one theory is that the plant switches photosynthetic focus from biomass to terpene production. If you have ever wondered what terpenes a cannabis variety has in it then take a look at the chart below, showing a recent analysis of Dutch Passion Lemon Zkittle. This is one of the more impressive recent terpene analysis results and shows what a complicated material cannabis is. Of course, each variety of cannabis will have it’s own terpene profile. And a lot also depends on the growing conditions and curing conditions used. LED is fully proven in the legal cannabis grow industry and growers of the highest quality buds would never downgrade to HPS lights even though they are cheaper. Dutch Passion’s sister company, LED By Passion, are resellers of some of the world’s highest quality LED brands such as Fluence, California Lightworks, SANlight, Growspec, CT Lite and GN. All the lights sold by LED By Passion have been through a full grow-cycle test. The lights are fully guaranteed and come with an e-voucher for Dutch Passion seeds. Connoisseurs should also consider further boosting potency by adding a UV-B light supplement to your grow room for 3-4 hours per day for the last 2-3 weeks of bloom. This adds useful UV wavelengths to your grow room which stimulate extra cannabinoid and terpene production. And with the high-end LEDs from the top manufacturers rated up to 100,000 hours, the average home grower can expect a decade or two of maintenance free ownership. During that time light intensity will drop only marginally. LED is a natural fit for high quality cannabis growers that want the very best and don’t mind paying a little extra for it.